Car sales are a massive 32.1% higher than last year. NEW CAR REGISTRATIONS were to thank for a major lift in consumer spending during July, new figures from the Central Statistics Office show. Overall, sales volumes were 8.2% higher than last month, with a mammoth 36.1% rise on July’s volume of car sales, the biggest improvement across all categories covered. On an annual basis, sales volumes are 8.6% higher than this time last year, with car sales 31.1% higher. Investec Ireland chief economist Philip O’Sullivan said that more expensive items are starting to make a comeback as consumer spending catches up with positive sentiment around the economy. All in all, O’Sullivan said that this morning’s numbers are impressive if not surprising given the heavily-flagged upturn in car sales after the turn of the half-year. Davy economist David McNamara said that he expects consumers to spend 1.5% more this year than last, which will rise to 1.9% in 2015. 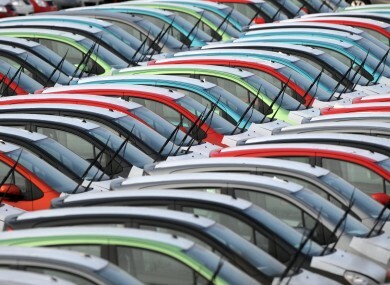 Despite the “exceptionally strong” figures, Cantor Fitzgerald analyst Fiona Hayes said that the volume of sales actually fell last month by 0.7% on the month when car sales are excluded, and were up by a “less robust” 3.1% in the year. She also warned that in previous quarters higher retail sales had not necessarily translated into bumper consumer spending in GDP releases. Email “142 registrations drive 'exceptional' consumer spending last month”. Feedback on “142 registrations drive 'exceptional' consumer spending last month”.